KELOWNA, B.C. – Aug 4th, 2017. Residential sales in the Okanagan region of Revelstoke to Peachland moderated slightly in July, with 961 sales posted to the Multiple Listing Service (MLS®), down 6% from June, and just 2% fewer than July last year reports the Okanagan Mainline Real Estate Board (OMREB). “While sales activity typically slows over the summer months, with this July no exception, pricing and days on market continue to show strong demand for available housing supply,” says OMREB President and active Central Okanagan REALTOR® Tanis Read. At $504,712, the average July price in the region was a mere 1% lower than June and 6% higher than this time last year, while days on market, or the average time it takes to sell a home, was 63 in July, as compared to 73 in June and 79 last year. “Although these figures offer a general overview of market conditions, averages tell only part of the story and prospective buyers and sellers can benefit from consulting a real estate professional about how current conditions impact the neighbourhood or housing type of interest,” comments Read. “One might be surprised at how sales and pricing within certain communities and/or housing types can run counter to general market conditions,” notes Read, adding that a REALTOR® who knows the local market can bring a level of knowledge and in-depth data analysis that can help inform decision-making. Year to date, buyers of homes in the region served by OMREB were primarily those who already live in the area, at 56%, with first-time buyers accounting for 20% of the buying population, followed by moveup buyers at 17%. Buyers from the Lower Mainland and Vancouver Island accounted for 19%, followed by Alberta buyers at 10%, with buyers from outside Canada comprising a mere 2%, according to a monthly survey that OMREB has conducted since 2010. OMREB serves three diverse markets within the region: the Central Okanagan Zone (Peachland to Lake Country), the North Zone (Predator Ridge to Enderby) and the Shuswap- Revelstoke Zone (Salmon Arm to Revelstoke). For detailed statistics specific to each of the three regions served by OMREB, visit www.omreb.com. 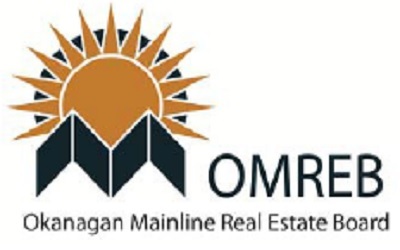 OMREB is a member-governed not-for-profit association representing more than 1200 REALTORS® and 92 real estate offices within the southern interior region of British Columbia (Peachland to Revelstoke). The Board is dedicated to providing leadership and support to its members in their pursuit of professional excellence. DISCLAIMER: Monthly Sales statistics are based on the sales reported by real estate offices on or before the last day of the month. Sales not reported by month end and collapsed sales are reflected in the subsequent month’s statistics.